Sweet T had her first sleepover last month and we made slime for hours! 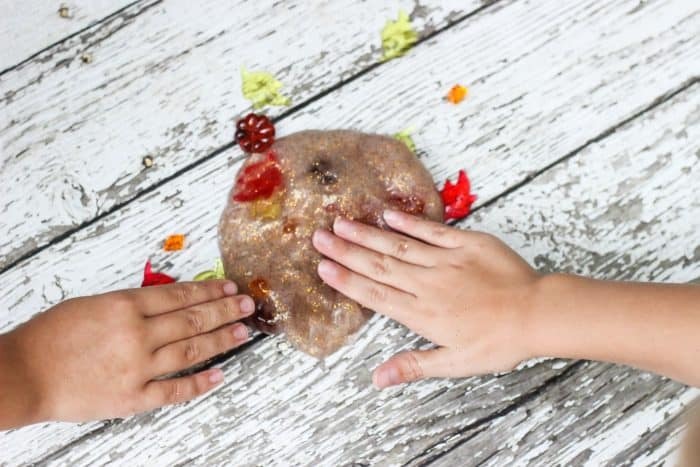 This fall slime recipe was one of their favorites our of all the glitter slimes we made. We loved how the acrylic pieces (even the pumpkins!) stayed suspended in the slime in spite of being a little heavier that what you typically add to slime. 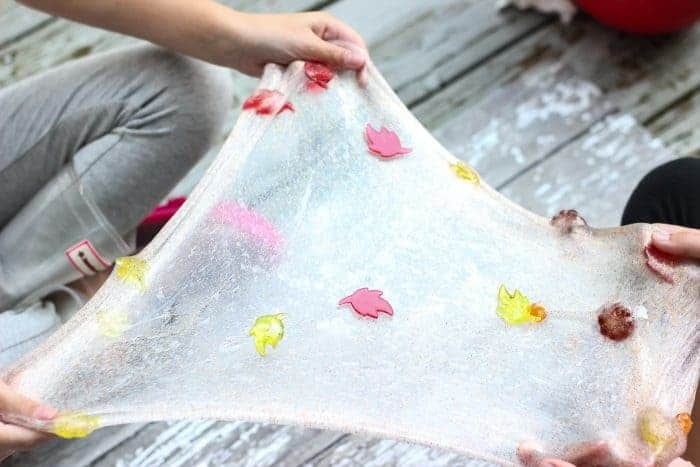 This fall slime is sensory play at its finest. I recommend you create it together outdoors on a lovely autumn day. There’s less mess that way too! Make a batch of my basic Halloween slime recipe with clear glue. Click the link or scroll down to the recipe card for exact details. Add glitter to the slime. I let the girls chose the colors and they picked orange, gold, and brown and lots of it. See? I was a little skeptical about all that glitter since it was looking like a brown blob at first, but once it’s stretched out, it’s gorgeous. The lesson here it to trust the kiddos when it comes to glitter. Add your table scatter and boom! You’ve got fall slime. It’s sooooo stretchy and fun. I might even have gotten in on the fun a little. It’s a stress reliever to play with it! I wonder if slime will soon be marketed to adults like coloring books now are. 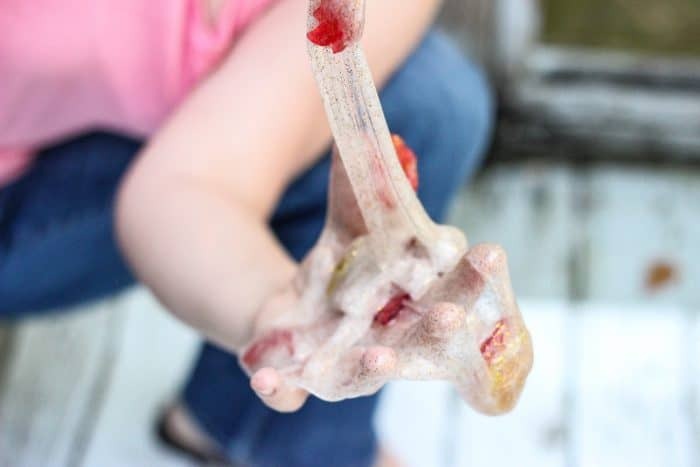 At any rate, you’ll want to play with this fall slime with your kids for a peaceful, mindful time of sensory play. We love it! Check out our other slimes for fall and Halloween too! 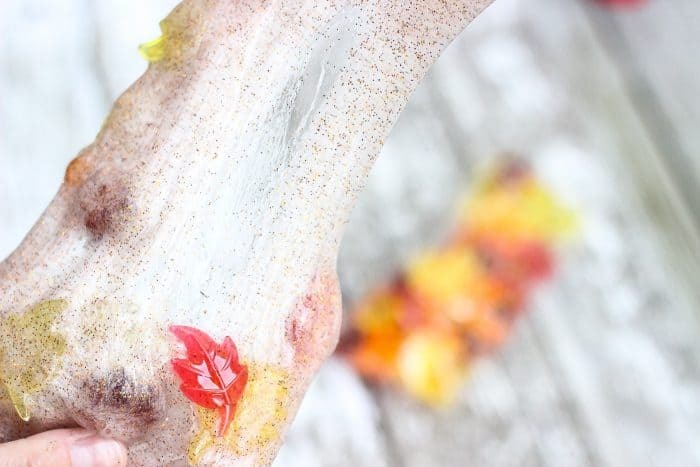 This fall slime recipe makes for an easy fall crafts for kids. My daughter and her friend loved it! 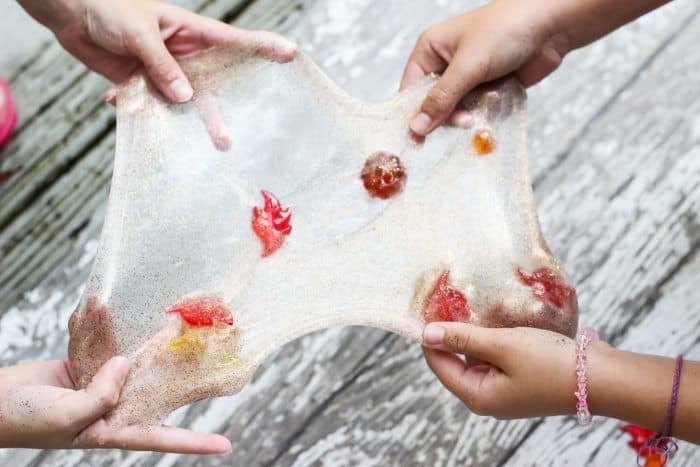 Once your kids make glitter slime, you'll both be hooked.